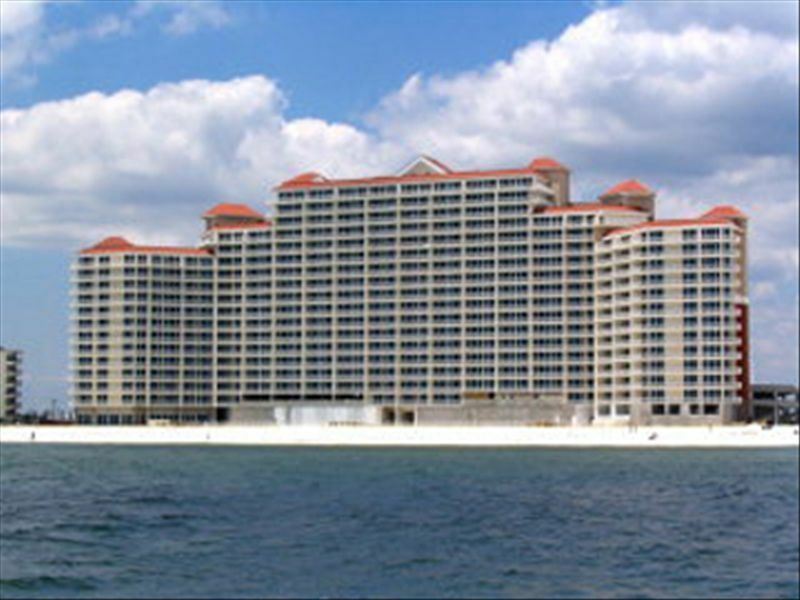 The Lighthouse is Gulf Shores' newest and the most popular rental complexes. Offering breath-taking views of the Gulf, beautiful white sand beach, larger and more deluxe units than the norm and a top amenity package. The unit is beautifully and professionally decorated with all the comforts of home, including DVD/large (50' in living room) High Definition, Flat Screen TV's in every room, jacuzzi bath tub, granite counter tops, a full two bedrooms /two baths and an additional bunkroom (includes tv/dvd and a door on the room) which is great for the kids. Lighthouse offers a great location, within walking distance to numerous restaurants and activities. Lighthouse offers two beautiful outdoor pools (one with zero entry and water spouts, indoor pool, 2 hot tubs, sauna, barbeque grills, fitness room, covered entrance/lobby, covered parking, and much more! Note: We own two units in this building #805 & #505 (vrbo# 1099723), so tell a friend or relative and vacation together! They are identical units. The Lighthouse offers several unique features that we love. It is two bedrooms plus a bunk room which enables us enough room and sleeping that we can even share time with our friends. It is a newer complex that offers a tremendous amenities package and is also walking distance to numerous restaurants and shops. With it being walking distance to the public beach, it is awesome being able to park and walk to the many festivals and events at the Hangout and "T". A Condo on the beach! Do I need to say more? Well decorated condo with everything we needed. It is a two bedroom but also had a small room with 2 bunks with tv & DVD player that we really liked for the extra space. Balcony was great - right on the ocean and 5th floor is not too high. The pools and grounds are well kept. The king bed in the master is very firm - too firm for me but fine for my husband. Master bedroom, master walk-in closet and master bathroom were very spacious with plenty of storage space. This was a great place for a grandma and grandpa, two adult daughters and two grandsons! This condo was beautiful, roomy and very clean. With the exception of a few stains on the dining chairs' cushions, the furniture was in great shape. There was one set of towels that were pink. It looked as though they had been washed with something red that had faded onto the towels. Even with the stained cushions and pink towels, there was no doubt that everything was clean. The Keurig coffee maker was a big plus for us. Loved it! The beds were comfortable We take a beach trip every Fall with my husband's sisters, spouses and some of their grown children. There were 13 of us this year and we all stayed at the Lighthouse. Our condo was where everyone gathered before dinner and then after dinner for game nights around the table and/or watching the Braves on tv. There was room for everyone! The weather was perfect. Overall it was one of our best visits to Gulf Shores. The owner was easy to contact for check in information - he answered his phone immediately. While we had no complaints and no reason to call the owner, I felt that if we had had a problem, he would have handled it just as quickly. We will definitely remember this condo next year when planning our beach trip. Thank you for allowing us the privilege of staying in your condo for a few days. God bless! The condo was clean and everything was as promised!! Will be booking for next year again!